Here is a great collection of 3 minute motivational videos. Please browse this collection to find the videos that resonates most with you. Each of these motivational videos is only 3-4 minutes long and each provides inspirational quotes, poems, motivational thoughts, or short stories to encourage and uplift you. These are great to watch when you need a "pick me up" on the job or when you need some motivation at home. It’s that one extra degree that makes all the difference. Great tips for leaders on how to treat their front line which will impact the way they treat the customer which will in turn affect the company’s bottom line. It’s that one extra degree that makes all the difference. It separates the Good from the Great with many great examples of the small margin between an Olympic Gold medal and no metal at all. Develop a 212° Attitude! Stop procrastinating! This movie encourages you to "Eat That Frog!" (your most difficult task on your to-do list) first as a key strategy in accomplishing more with less effort, as you will no longer have the emotional drain of anticipating that dreaded task. Inspiring video relaying the stories of courage of people who "Finished Strong" despite facing tremendous adversities – Very inspiring! Great for anyone who is a fan of golf. Return to top of page for 3 Mintue Motivational Videos. Inspiring quotes from some of our greatest leaders. "The best of the best" quotes. Be prepared to be inspired! Be inspired by the quotes of some of the greatest women in history. This movie presents the 10 Rules for being Human. These rules are practical, insightful, and uplifting. A recent study says we need at least 12 laughs a day just to stay healthy. What this video and get a couple laughs in. I loved this beautiful movie with heartfelt blessings. Great to send to someone experiencing challenges to uplift them and encourage them. Beautiful thought provoking movie about how just one choice can change your life forever. What one thing would you do to change your life for the better? Great movie if you are going through a challenging time like a divorce or health challenge. This a touching story for Christians about the humble life of Jesus Christ. Twenty centuries have come and gone and that one solitary life has become a central figure of the human race. Learn lessons about teamwork from the geese. I really liked this insightful movie about the difference between the "middle class" and the "world class." Good food for thought on the changes that would be required to go from "middle class" to "world class." This movie is a MUST HAVE for our high stress quick paced society. It provides great rules to simplify your life and thereby reduce your stress. Enjoy! It's not the date you were born, or the date you died, that really matters. 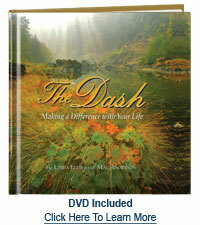 It's "the dash" between those years and what you do with it, to make a difference with your life. Nice movie for a memorial service. This movie takes you on a journey of personal discovery to develop a positive attitude, reduce stress, attack your fears, and keep your passion alive! Discover the 7 ways the power of discipline can change your life. This video is inspired by the ultimate team: the United States Navy's world - renowned flight demonstration team - the Blue Angels. While the Blue Angels certainly differ from your organization, the underlying principles for success still apply. The Lombardi philosophy transcends football. His powerful words capture the fundamentals of success in any sport, business and life. Nature's lessons in leadership and teamwork, learned from the powerful wolf pack. Apply these lessons to your business, family and personal life. Note: This is only a portion of the free motivational videos available for your viewing pleasure. To view the entire collection of motivational movies, please visit the Simple Truths Movie Gallery.